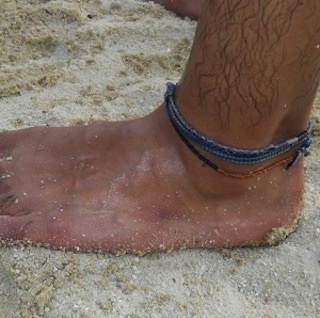 Anklets is the most trendy and smart looking accessory worn by both men and women. 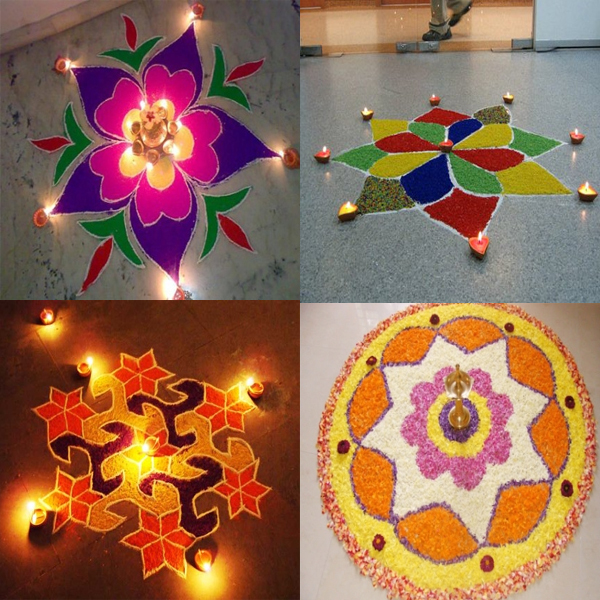 Anklets are found in many dynamic designs which suits well to any occasion, parties and even a cool office wear also. Simple anklets could be correct choice to be worn in offices as well to any formal parties also. The simple anklets look gracious and add glory to one’s personality also. This type of simple gold anklets is timeless and are classic to wear. The anklet has a glazed bent tube and the other part has a linked chain thus giving a lustrous look to soft and beautiful ankles of a woman. This type of anklets can be best gifting option to your loved ones. The pearl anklet looks very unique and elegant and almost looks like a integral part of your shoe and giving you and you’re dressing a dynamic appearance. In between the anklets small dazzling round shaped crystals is studded with golden lining making it appear flawless piece of accessory. Simple and elegant is the right phrase for these silver double layered anklets. 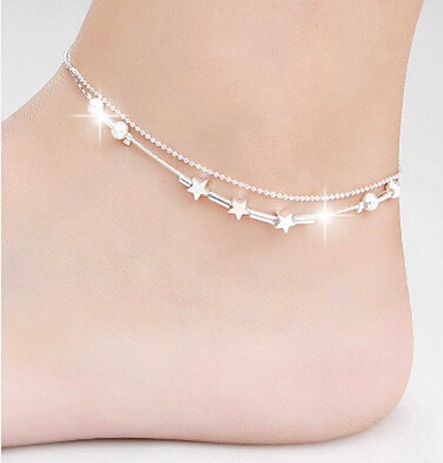 The anklet appear unique and daintiness and are perfect for young girls. 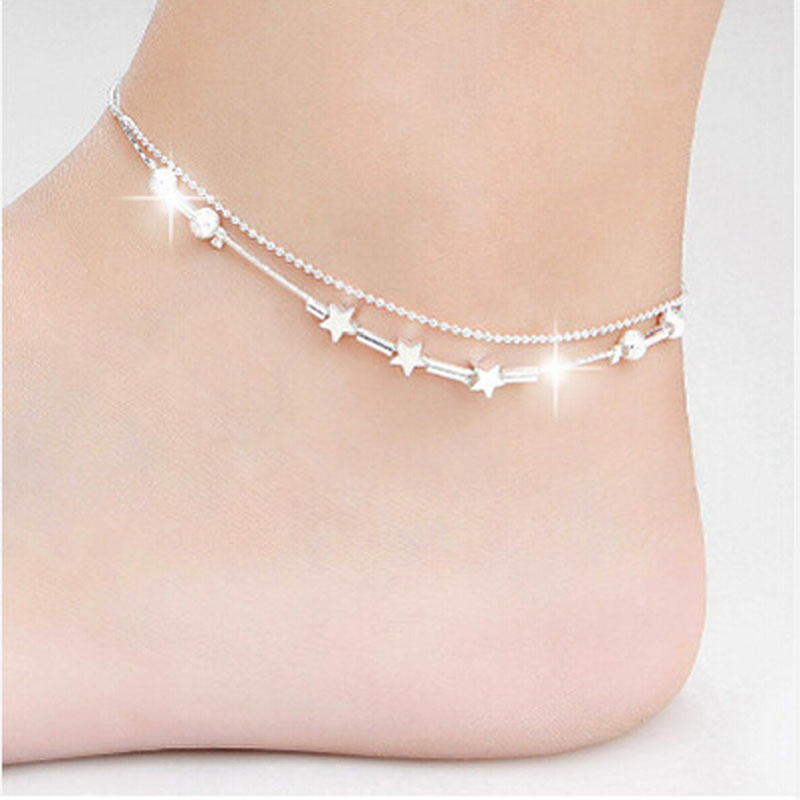 The small sparkly stars embedded on the anklet makes it appear heavenly and a perfect simple yet classy piece of anklet. Here comes an ideal anklet for females who are in love with nature and even wants to resemble the same in their wearing and accessory. 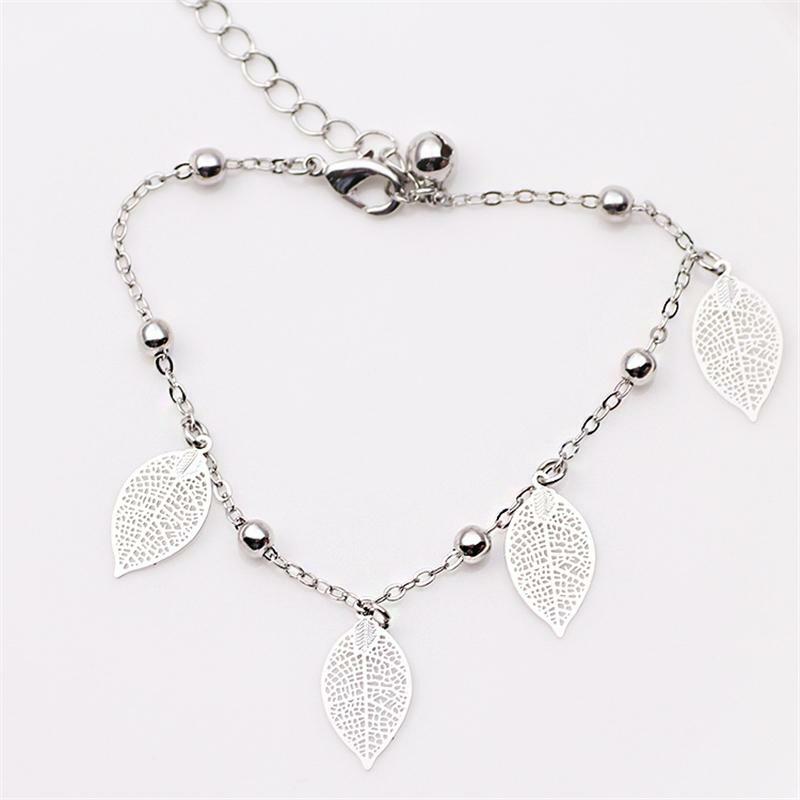 The anklet is designed in steel and small cute beads are beaded in between. 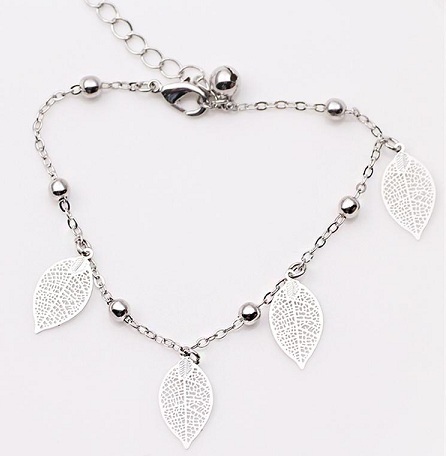 On the edges fine and delicate leaf shaped charms are embedded making it the classiest appearing anklet. This type of anklet portraits the spiritual bend of mind. On the anklet silver plated cross anklets are hanged making it more exciting and can easily grab the attention of other towards you. This is a lovely and simple appearing anklets made from threads. In between the thread silver infinity charm is studded making it appearing amazing on a man’s ankle. This type of anklet could be a perfect gifting stuff to your beloved or to any close male friend. An accessory made of leather is always a hit in men folk. This simple anklet is designed of pure white leather in a knotted pattern. On the edge of it a small silver boat is hanged and this type of anklets can be matched with any kind of outfits you desire. 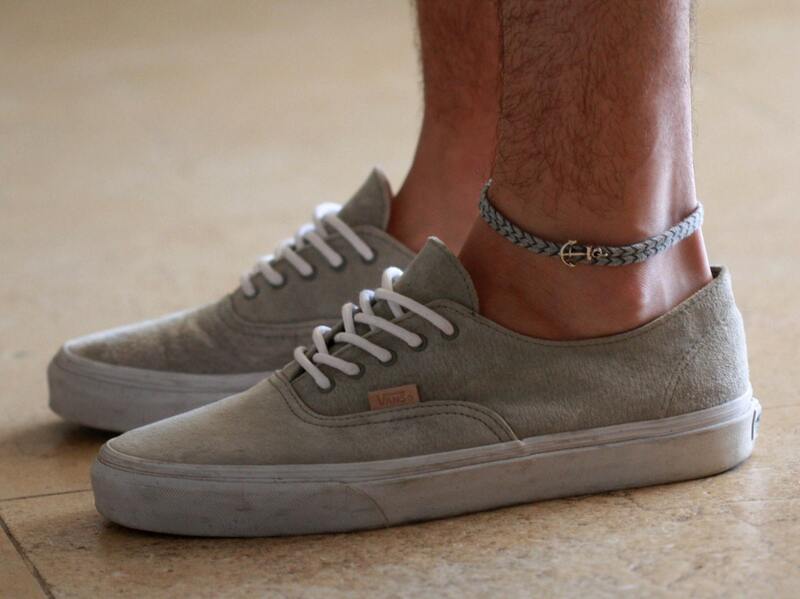 This type of grey coloured fabric anklet looks superb on every man rough and hard working legs. This anklet is designed marvelously in two layers and a cool looking silver plated anchor charm is fixed making it bit different and stylish from other anklets. 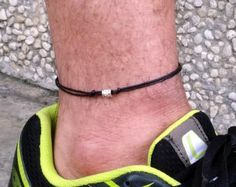 This is a must type of cool anklet for every man .The anklet has dynamic four layers all woven together appearing very trendy and distinct from other. These types of anklets are perfect to be paired with shorts to show off these anklets. One of the most trendiest and cool looking accessory worn by both men and women, is these simple and elegant looking anklets. These simple anklets are designed in precious metals like gold, silver and make a person look very beautiful and awesome. The simple anklets are also breathtaking ones, and you can choose from the platter the most suitable anklet according to your outfit.